From the Long Island Who convention on, well, Long Island: here’s the audio of Chip and Erika’s panel, “The Whovian Guide to Babylon 5.” Mild spoilers for the series are ahead as a roomful of Doctor Who and B5 fans compare and contrast the two series and look back on a beloved moment in time when new B5 episodes aired on random independent TV channels. Please note that we have no explanation for why Chip and Erika look like Grumpy Cats in the above photo. Listening to people talk about B5 shifting stations and everything I am so glad that at least in the Sac, CA area it was at least always on a consistent station (for the first four seasons at least) even if we did sometimes have to find a new time slot and deal with basketball pre-emption. I still don’t like watching basketball because of this, despite my wife’s enjoyment of the sport. I only just recently stumbled upon the Audio Guide to B5, and I’ve been listening to it a lot at work. (I’m a graphic designer, and I get to wear headphones a lot. Podcasts and soundtracks and Big Finish get listened to, and woe betide anyone who requires me to remove the earbuds.) Babylon 5 was my favorite show in the ’90s, and as much as I’ve enjoyed that long-game, arc-based TV has become the new normal, it remains my favorite example of that stylistic tool to this day. It still holds up as so elegantly constructed that shows like Lost and Battlestar Galactica v2.0 end up feeling thrown together by comparison. Warner used to send out some really neat promo goodies – somewhere, I actually have my own copy of Universe Today, sent out around the launch of season 1, complete with the “Is something living in hyperspace?” headline. I still have a ton of that stuff – B&W publicity glossies, slides, and so forth. Just the other day I found, completely by accident, a bunch of unused ad slicks to be sent to local TV listings pages. Good times. 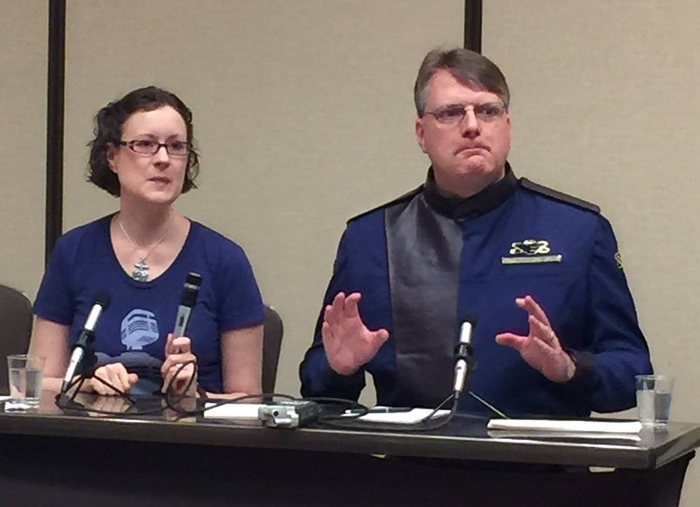 I was stunned and delighted to hear someone podcasting Babylon 5 so long after the end of the show. So much of what TV has become has happened because – in my opinion – Babylon 5 and Twin Peaks kicked the door open on different stylistic fronts…door-kicking that now gets attributed to Buffy, Battlestar Galactica, even new Doctor Who (whose showrunners I’ve often felt really need to rewatch B5 so they can learn how to “do arc”…I’ll send Chibnall my DVD box sets if it’ll help). Anyway, I just wanted to drop a line to let you know how much your show is appreciated. I host a podcast or three myself, and it’s a huge amount of work to put it all together even if you’re flying solo, and that’s before one gets to distribution, promotion, and engaging with listeners after that. My hat’s off to all of you. Keep up the good work!